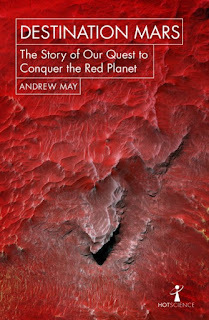 Although the book does cover the planet in an astronomical sense and the many unmanned probes and rovers (with all too many suffering disasters), its prime focus is the most exciting bit - the aim of getting human beings to Mars, and the possibility of setting up a long-term colony there. May does not underplay the difficulties here. This is no over-optimistic brochure for a Mars venture. But he does also look for solutions to the many problems and gives us an upbeat picture of the possibilities. If I have a criticism, it is that the book comes across as a bit an engineer's vision of the challenge of getting to Mars. May is an astrophysicist by training, but sometimes he gives us a bit too much systematic working through possibilities and probes for me, where perhaps fewer examples explored in more depth, leaving the complete details to an appendix, might have been better. But, having said that, we soon get back to something that's more inspiring. This isn't an in-depth book - it's part of a series of short 'Hot Science' books - but it seems to have just the right amount of content to capture the imagination and spur the interest of the reader in the dramatic possibilities of a venture to a closest cousin of a planet in the solar system. It would work well for a younger reader with an enthusiasm for space or for adults who look back fondly on the Apollo missions and hope for more real space exploration in the future. Please note, the reviewer is series editor for the series this book forms part of, but this is an unbiassed opinion on the book itself.